Lately I’ve been spending quite a lot of time on top of Amsterdam’s newest attraction — the nearly 100 meter tall A’DAM Toren. Located in Amsterdam Noord, just across the water from Central Station, its observation deck provides fantastic, 360° views across Amsterdam and beyond. I find it fascinating to see familiar landmarks from a new perspective. Look at the Westerkerk, for instance, in the center of Amsterdam. Completed in 1631, it is a huge building that towers high above the houses surrounding it. I don’t offhand know how high the nave of the church is, but the tower is 85 meter (87 says Wikipedia, but that is with the weather vane included). Mind you, the average building height in all of Amsterdam is only 30 meter — 15 meter in the historical city center. The height of the church is an indication of how important religion was at the time. How times have changed. 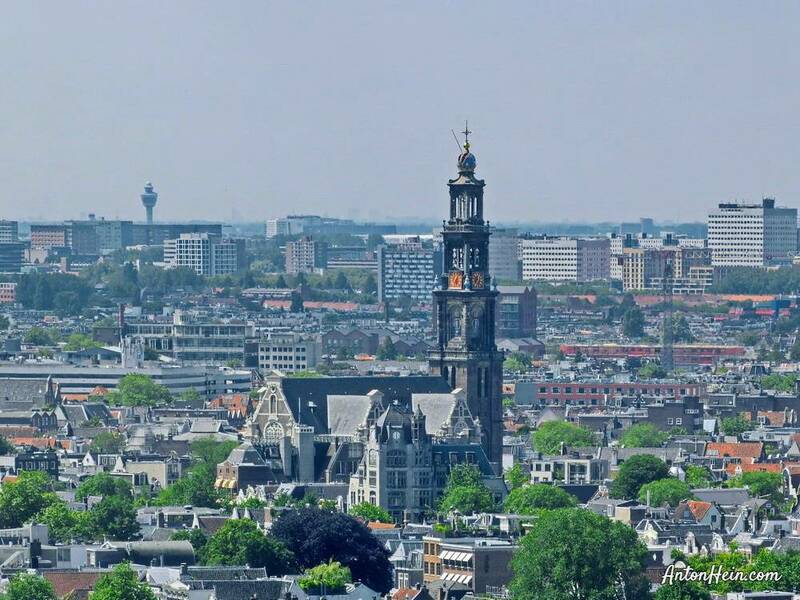 In her diary Anne Frank described hearing the bells of the Westertoren — and seeing its clock-face — from a small window in the nearby building in which she and her family hid during the Second World War. I often think about that when I see the tower. Nowadays the Anne Frank House, with its secret annex, is one of Amsterdam’s most popular museums. Want to see Amsterdam from above yourself?